Use this package if you need more customization when notifying your user. For Android developers, it is made to substitute toasts and snackbars. IOS developers, I don't know what you use there, but you will like it. This is a flutter widget inspired by Flashbar. Development of Flushbar and Flashbar are totally separate. The examples bellow were updated for version 1.3.0. Changes might have been made. See the changelog if any of the examples do not reflect Flushbar's current state. The most basic Flushbar uses only a message. Failing to provide it before you call show() will result in a runtime error. Duration, if not provided, will create an infinite Flushbar, only dismissible by code, back button clicks, or a drag (case isDismissible is set to true). Here is how customized things can get. Don't forget to call show() or the bar will stay hidden. To deactivate any of those properties, pass null to it. Flushbar can be either floating or grounded to the edge of the screen. I don't recommend using aroundPadding or borderRadius if you chose FlushbarStyle.GROUNDED style. Flushbar has a lateral bar to better convey the humor of the notification. To use it, simple give leftBarIndicatorColor a color. 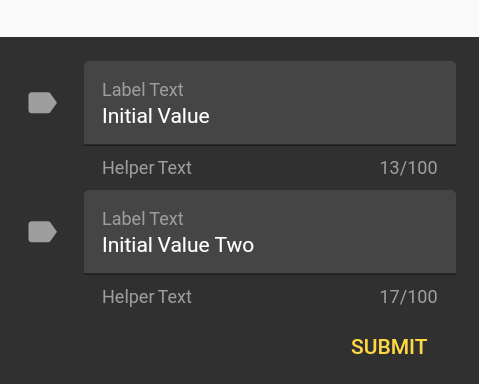 If you need a more fancy text, you can create a Text and pass it to the titleText or messageText variables. You can paint the background with any color you want. You can use any shadow you want. Just give it a backgroundColor and a boxShadow. Want a gradient in the background? No problem. Let us put a Icon that has a PulseAnimation. Icons have this animation by default and cannot be changed as of now. Also, let us put a button. Have you noticed that show() returns a Future? This Future will yield a value when you call dismiss([T result]). I recommend that you specify the result generic type if you intend to collect an user input. Flushbar can be at FlushbarPosition.BOTTOM or FlushbarPosition.TOP. By default, Flushbar is infinite. To set a duration, use the duration property. By default, Flushbar is dismissible by the user. A right or left drag will dismiss it. Set isDismissible to false to change this behaviour. You can set custom animation curves using forwardAnimationCurve and reverseAnimationCurve. You can listen to status update using the onStatusChanged property. Note that when you pass a new listener using onStatusChanged, it will activate once immediately so you can check in what state the Flushbar is. Sometimes we just want a simple user input. Use the propertyuserInputForm. dismiss(result) will yield result. dismiss() will yield null. I made a helper class to facilitate the creation of the most common Flushbars. Breaking Change expect for onStatusChanged, all properties are now final. Two dot notation does not work anymore. Since you can only use the instance one time, this is the best practice. Behaviour change dismiss is now vertical by default. This is more natural since Flushbar show animation is also vertical. It is now possible to dismiss a Flushbar that is not the top route. The only inconvenient is that it will not animate back (simply disappear) and the listener, if used, will not register the dismissal. Looking good for version 1.0. Please, report any issues your have. IMPORTANT dismiss() now returns a future when the animation is completed and route is poped. That makes it easier to concatenate two or more Flushbars. Major changes on how show and dismiss animations work, making Flushbar more reliable. Trying to dismiss() a Flushbar that is not the top route is going to throw an error. Pressing the back button will now properly dismiss() Flushbar. Performance improvements. In and out animations are smoother. When using a Form, the keyboard is not shown. Still figuring out how to solve it. Blink animation when Flushbar is not dismissed now animates the whole bar and is synchronised with content change. Common filename patterns include main.dart, example.dart, and flushbar.dart. Packages with multiple examples should provide example/README.md. A flexible widget for user notification. Customize your text, button, duration, animations and much more. For Android devs, it is made to replace Snackbars and Toasts.